1st Edition., 2011, 831 p. 122 illus., 12 in color. The Annual Update compiles the most recent developments in experimental and clinical research and practice in one comprehensive reference book. 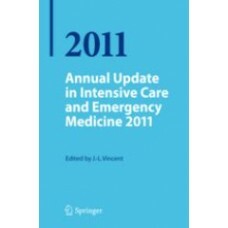 The chapters are written by well recognized experts in the field of intensive care and emergency medicine. It is addressed to everyone involved in internal medicine, anesthesia, surgery, pediatrics, intensive care and emergency medicine. Are Microparticles Reliable Deleterious Effectors in Septic Coagulopathy? Crystalloid or Colloid Fluids: A Matter of Volumes? Acute-on-chronic Liver Failure: An Entity Still in Search of Itself? Should we Still Order Chest X-rays in the ICU? Intensive Care Medicine: Where We Are and Where We Want to Go?